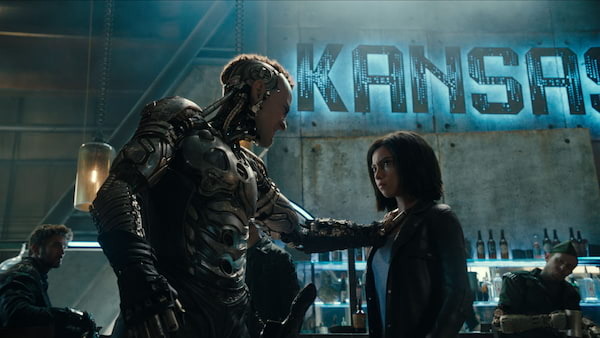 ‘Alita: Battle Angel’ is epic in size and scope. There is so much story in its two hour and two minute running time that it breezes through many of its emotional beats to deliver an expanse of events and character shifts, and condenses this within the span of what feels like a week. 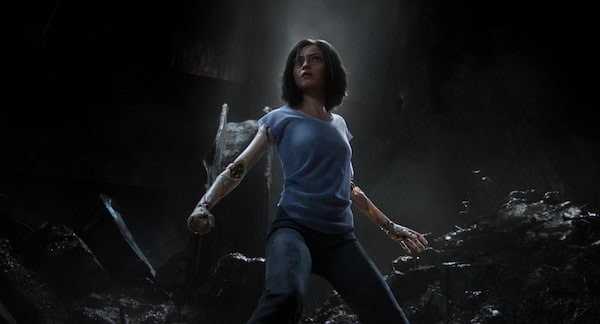 It was no surprise then that director Robert Rodriguez and scriptwriters Rodriguez, James Cameron, and Laeta Kalogridis (based on the graphic novel series by Yukito Kishiro) announced that the story of ‘Alita: Battle Angel’ was taken from four volumes or books of the original graphic novels. And you feel it. In the very far future, the world is totally different than what we know. The world below is a dirty, dangerous city of iron and steel and they are the dumping grounds of the last of the floating city, Zalem. It is in these dumping grounds, Dr. Dyson Ido (Christoph Waltz) finds the remains of a cyborg that is still alive. He repairs her and brings her back to life and gives her the name Alita (Rosa Salazar). Within the next two hours, Alita discovers this new world she finds herself in as she has no memories whatsoever of the life she used to have, finds the truth of her origins and why she has super warrior reflexes, and becomes integral in discovering the truth of Zalem. If that doesn’t seem like a huge story to tackle, don’t worry, there’s also a love story with the scrappy, street-wise Hugo (Keean Johnson), a mysterious cybernetic doctor (Jennifer Connelly), and a deadly sport called Motorball, which is like a cyborg version of roller derby, which involves Mahershala Ali’s Vector, a very shady individual. At first, I was taken aback by the film’s quick pace. A movie usually has to reinforce questionable behavior with several scenes before a character can change from trusting to suspicious. But in ‘Alita: Battle Angel,’ one singular moment can turn a character’s loyalty and move us straight into another chapter. This happens very often in the film. Alita and Hugo form a quick bond in just a few scenes. She discovers her true origin at almost the halfway mark through the film. It’s as if the narrative cannot stand a mystery. It has a lot of ground to cover to reach its huge ending. Because of this pace, the film hardly manages to really strike emotional chords. There are moments when you know that a scene should be touching or could resonate but it doesn’t, because it never really digs and establishes the foundations of a story for you to gain the momentum needed to have a cathartic connection with a dramatic scene. Surprisingly, though, it’s not so much as a weak point. The world is interesting. 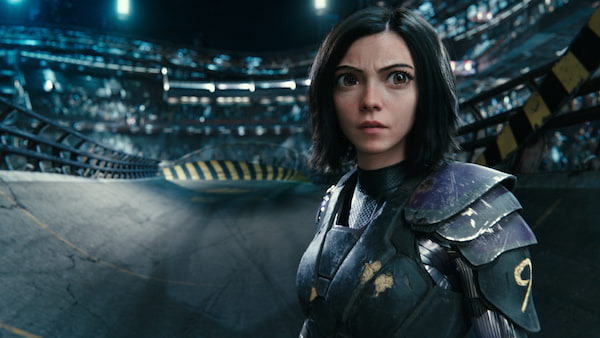 Alita, herself, is captivating (largely because of Rosa Salazar’s refreshing performance). And the fight sequences are thrilling and hard-hitting and stunning. It’s fast and brutal and impressive. I actually get excited to see her fight. And, another big surprise, Rodriguez effectively picks and chooses his moments to highlight. For a film with so many revelations, peaks and falls, he chose just about two or three scenes to truly play for its dramatic potential. 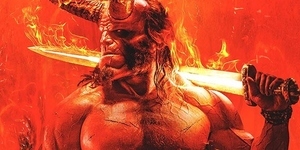 All the other big scenes, he just throws away as plot points and so the film never dawdles with its inability to connect dramatically. He’s looking at the bigger picture and not every individual moment so that, by the end of the movie, you get your catharsis in one way or another. It’s a marvel of storytelling, to compress all that plot in a relatively short movie, and still deliver the thrills and the heart that unexpectedly comes at the end of the film. On IMAX, the film is gorgeous. It’s alive and bristling with energy. Rosa Salazar and Keean Johnson have exciting energy. It’s a sort of waste of Jennifer Connelly and Mahershala Ali’s talents, they don’t get to flex their acting muscles too much here but you get a healthy dose of what I wanted to see: stunning fight choreography and some novel ideas about a world with cybernetic humans. I was coming in ready to be disappointed and instead, I was pleasantly surprised by the experience. If ‘Alita: Battle Angel’ does well, which I hope it does, then I can’t wait for the eventual sequel. 'Alita: Battle Angel' opens in Philippine cinemas on Wednesday, February 6, 2019. The film will have special sneak previews on February 5 (starting at 7:00pm) in more than 200 screens nationwide.